I wasn't expecting to make a post tonight but my dinner came out so much yummier than I expected that I had to share the recipe. 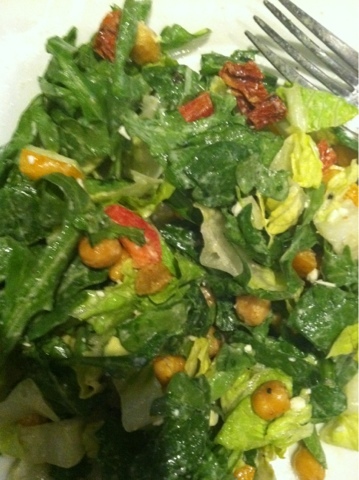 For the record - no, I don't only eat salads, I know I've been posting a lot of them lately. I am, however, known in my family to be the master salad maker. I have a knack for making boring greens into something much tastier. First, let's start with a tip. I went out for lunch with my team today at an American restaurant. I made a quasi-healthy choice but it was still more caloric than my usual greek yogurt/berry mixture/nut mixture. When you have days like this... you don't have to give up eating healthy for the rest of the day - balance it out! Go ahead and enjoy a heavier lunch but make a lighter dinner! - 1/3 cup Garbanzo beans (chickpeas) Seasoned w/ cayenne pepper, salt, and crushed red pepper and baked ('how to' below under photo) Tip: Cayenne pepper has capsaicin, a compound that has been found in SEVERAL studies to naturally increase metabolism and reduce inflammation in the body. Next, chop and arrange all ingredients on the plate and toss with the dressing. Next, sprinkle onto salad and enjoy. I LOVED this salad tonight. The kick from the cayenne was delishhhh. 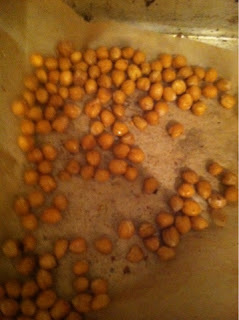 I saved the rest of the chickpeas for snacks later this week or perhaps in another salad again over the weekend. Dessert Lovers - I hear you. If you know me, you also know that MOST nights, I have a little frozen yogurt, or a couple pieces of dark chocolate for dessert or the below dessert. I love dessert and I do not give it up often. 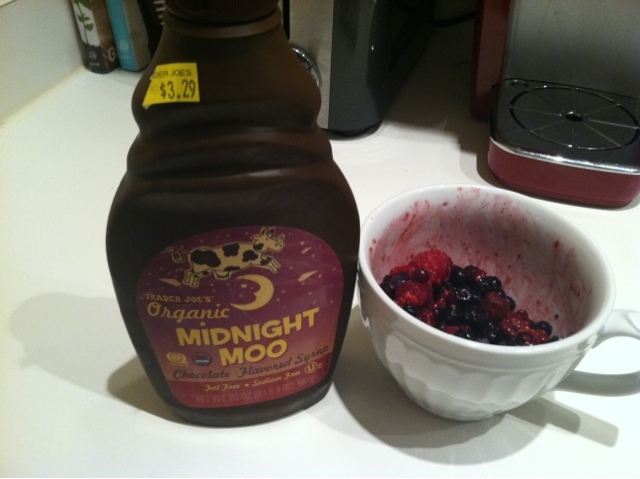 A dessert that fills the craving without adding as much sugar as frozen yogurt is Berries with Chocolate Syrup (Trader Joe's makes "midnight moo" which has organic ingredients, zero preservatives, and nothing fake - it's FAR BETTER than Hershey's syrup. It has 90 calories in 2 tbs, so go easy! 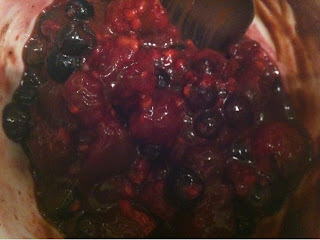 How to make it: Just grab your frozen berries, throw them in a cup, pop in the microwave with some cinnamon (antioxidants - remember?!) and heat for less than a minute. Add a drizzle of the chocolate syrup and you're done! Have an awesome nightttt - it's almost the WEEKEND - WEEEEEEEE!